The new government’s reported U Turn on excluding the Green/Blue Recycling Bin from its planned roll out of Pay x Weight on July 1st, was based according to minister Simon Coveney Minister for Housing, Planning and Local Government on the RTE Six One news on the basis that it made no sense to charge people to do the right thing and recycle plastics, paper and other materials. Repak Ireland’s role here as the company that has always paid for the majority of this waste collected has been conveniently suppressed, and is probably the real reason why the Green/Blue bin could not be included in Pay x Weight as would be charged for on the double. So Could Household Pay x Weight Be Deferred To July 1st 2017? So why should households care if Pay x Weight is deferred again, quite simply households will miss out on the financial savings that Pay x Weight will bring about for so many cash strapped families. The Brown or food waste bin will be charged much lower than that charged for the Black or mixed waste bin, with the minimum price being set by the state not the refuse collector. In fact anyone who currently has a Mixed Waste or Black Bin and No Brown or Food Waste bin will continue to pay excessive bin lift rates based on continually increasing Landfill levies and charges. Remember an estimated 60% of the contents of a family’s Black bin should actually be in their Brown bin once they get it, a massive saving to any household using it. Also if Pay x Weight is deferred for another year the fines that Ireland will have to pay the EU for noncompliance of the Landfill Directive, (under food waste non-separation) that money comes from the taxpayer so it’s a double whammy of a cost to households. 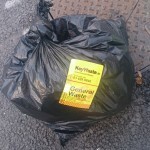 That’s just for the households that can accommodate wheelie bins, but for inner cities and towns all over Ireland who simply can’t accommodate wheelie bins they will be forced to continue to use their Black Bag filled with mixed waste at a ‘Flat Rate’ too regardless of Pay x Weights introduction or not. Being penalised with the highest payment option available, simply because of the inaccessibility for wheelie bins for their homes could well make the water charges issue uprising pale into insignificance by comparison. By July 1st this year although practically every home that can accommodate a Brown Bin will be given one by their refuse collector, a deferral of Pay x Weight and maintaining the ‘Flat Rate Charge’ for all bins, would as in the past see a poor usage of the Brown Bin. This would suit the next government, as large volumes of segregated food waste collected with no infrastructure to process it would be a nightmare situation that they could well do without. Far better for DECLG to have mixed waste generated as it is the only body that can sanction exportation of that mixed waste, continue to applaud itself with ‘Landfill Diversion’ targets achieved, and not have to deal with ensuring Ireland has the infrastructure needed to process a segregated food waste stream. 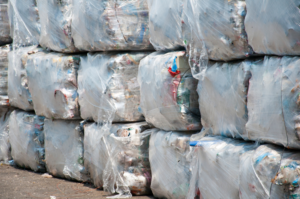 The new government will not want to be faced with huge fines from the EU for noncompliance under the EU’s Landfill Directive, again another reason for it to maintain its export waste policy. With only 2 of the 6 food waste centres Ireland had in the boom still converting this important waste stream, Ireland is totally ill equipped to process the massive increase of food waste that the National Brown Bin Roll Out will generate. Our excessive unsustainable dependence on exporting this food impregnated minimally treated mixed waste, a sanction only Ireland has, is the only release valve the previous governments had to control our ever increasing mixed waste mountain. Back in 2013 a report commissioned by the CIWM, part funded by Zero Waste Scotland and our own EPA owing to rising concerns even back then of unsustainable mixed waste exports from Ireland, recommended that Ireland cease that practice. Minister Alan Kelly kicked that report out for ‘Public Consultation’, even though its findings had already been published by its author Linda Ovens of AMEC in July 2013. 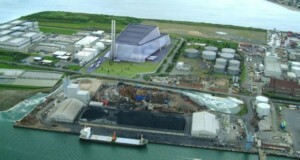 Ovens highlighted Ireland’s unfair advantage over the UK in being able to export its mixed waste requiring only minimal treatment citing its origins came from the EC 2007 Waste Management (Shipment) Regulations 2007 for Ireland. Once again this temporary release valve suited the government of the day by not having to deal with our lack of infrastructure needed to cope with processing that mixed waste in Ireland. It allowed the government to boast of its successful landfill diversion figures for processing of landfill destined waste, but other european countries did the processing for us and got the energy benefits from that valuable waste too. However that temporary export measure soon became the norm in Ireland and even the UK suffered similarly with its introduction in 1996 of high landfill taxes in attempting to force greater recycling measures in the UK. Much of the Uk’s private industry and some illegal refuse operators chose the export route. Our dependence on R1, MSW or Mixed waste exports are such that three and a half years ago Dublin Port sought a ban on this waste entering and being stored on its south side lands, as the odours were affecting the passengers of incoming ferries. 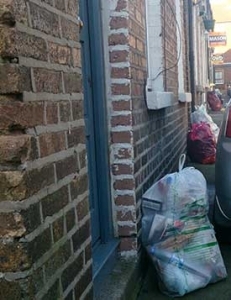 This waste stream rose in just three years by 300% to 300K Tonnes in 2014 and figures due out at the end of April from the Trans Frontier department of Dublin Council are expected to well exceed this figure again. Vivienne Ahern of the TF department told me recently that the figures we are interested in will be contained in the Amber List register once it becomes available. As stated by a Swedish Efw Plant engineer that for every 3 Tonne of this waste exported it is the equivalent in energy terms as 1 Tonne of oil. DECLG had this waste diverted to Drogheda and Dundalk from where it is still exported, (As advised by Harbour Master) totally undermining the Circular Economy, massively adding to its Carbon Footprint and is berated every year by the EPA’s Dr Jonathan Durham for same. Quote “In particular, the EPA welcomes the continued movement of residual waste away from landfill to energy recovery. However, an increasing reliance on the export of such waste is unsustainable” Dr Jonathan Durham said. 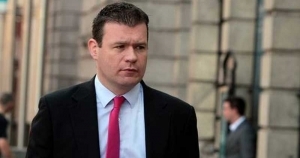 Minister for DECLG Alan Kelly introduced the idea of Pay x Weight and the legislation to support it back in 2013, it was intended that the full rollout of the Brown Bin nationally would be completed by July 1st 2015. At the trade launch meeting in AMCS Group’s facility in Fanningstown, Crecora, County Limerick of Pay x Weight in November of 2014, Philip Nugent Principal Officer to Minister Kelly informed the refuse collectors in the room that, ‘Flat Rate Charges’ would be abolished by July 1st 2015 and that all their fleets would have to be Pay x Weight compliant also by that date. When asked how refuse collectors were to deal with annual contracts they already had and were currently accepting, Mr Nugent replied that DECLG only involved itself with policy not operational matters, and that DECLG had warned of Pay x Weights introduction for some time. Asked if every Black bag would be weighed on collection too, the then answer was yes. December 2014 was to see TV ad’s rolled out over Christmas to inform the public of the impending introduction of Pay x Weight on July 1st 2015 but they never saw the light of day, Why? well DECLG got such a monumental backlash over Irish Water they feared further revolt should Pay x Weight be even mentioned. 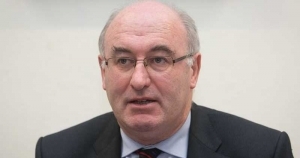 Phil Hogan had introduced ‘A Recourse Opportunity’ on July 1st 2012 to bring stability and encourage investment into the sector and failed to do so. Why? Well in November 2012 Hogan took part in a photo opp with City Bin welcoming them into the industry under the guise of their new majority share holder AVERDA and it’s €15 million investment. They introduced the ‘Flat Rate’ all 3 bins for €100 completely at odds with Hogans ‘A Resource Opportunity’ thereby discouraging segregation of household waste. Alan Kelly’s ‘A Race To The Bottom’ was to bring new standards to domestic refuse collection, and end the ‘Flat Rate Charge’ the main cause of mixed waste generation. Without the infrastructure and assurance of food waste as a feedstock current facilities are forced to switch between whatever is in biggest demand, and right now that’s processing Mixed Black Bag / Commercial MSW waste. Pay x Weight will be a huge revenue generator for the state’s county councils. Fingal Co.Co. has already begun to target households with no refuse contracts in a move to crack down on ‘Illegal Dumping’ of household waste. As every wheelie bin is micro chipped it’s now easier than ever for Councils to request printouts from refuse collectors on households that do not use a particular recycling bin and to pinpoint households with no refuse contracts. 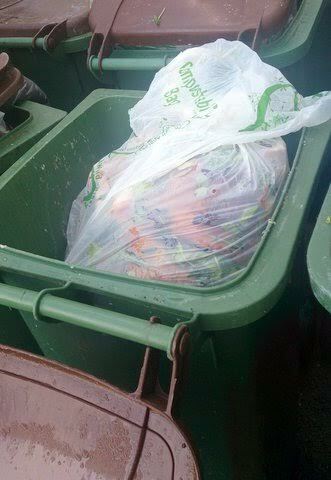 This will be most effective in identifying households who refuse to use the Brown bin, as in built into DECLG Pay x Weight legislation was the ability for councils to recruit inspectors and for them to charge a FPN or ‘Fixed penalty Notice’ for noncompliance of food waste segregation circa €45. 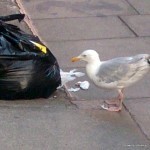 Even now it is illegal to put food waste into a Black bin if a household already has a Brown bin, however when the Brown bin is fully rolled out councils no doubt will seek to impose this ban and FPN’s more vigorously. Due to the massive increase in the generation of Mixed or MSW (Municipal Solid Waste) over the last 5 years, in order to recover the SRF element of that waste for export and for use by our cement industry as a fuel in its kilns the Bio or Food Waste element had to be removed first. Indaver’s media spokesperson Jane Hennessy confirmed this to me after the Prime Time programme in 2014 on Poolbeg, citing it was part of their license conditions from the EPA which allows them to accept waste for processing once it has been segregated. It’s this EPA requirement that has put so much pressure on Food Waste centres to switch to processing this MSW, and one can only assume the SRF recovered fuel is worth the cost over simply exporting it as R1 Minimally Treated Mixed MSW Waste. The Bio Waste product removed from MSW is referred to as ‘Organic Fines’ which has to be composted in order to stabilise it removing Pathogens etc to then landfill it. This stabilised waste product has no value and since its origins are from contaminated waste it can only be landfilled. A very expensive option but not when the Government removes the landfill levy so that this waste could be gotten rid of cheaply. However continued landfill volume restrictions is now causing those same Food Waste processing centres, that switched from Food Waste, to MSW waste, to now switch again to Farm Sludge processing. Key to any countries demand for ever increasing energy demands is to have access to and funding for renewable energy. AD or Anaerobic Digestion plants for which Food Waste is their prime fuel source are extremely effective locally based processing plants that generate electricity day and night. Germany and UK have hundreds of these facilities albeit subsidised, yet Government here is continuing to drag its feet over the unit to be paid for electricity generated. National Grid slots are not available to AD plants currently under construction from the ESB, as they maintain these slots have already been allocated to Wind Farm projects not even built yet. Even more road blocks to processing of Food Waste. Early part of 2015 saw trucks coming from Northern Ireland to Dublin to collect segregated food waste and transport it back up north. The UK government’s heavy subsidisation of renewable energy programs especially AD plants made this round trip collection feasible in order to secure Food Waste for its AD plants. However UK government rolled back on these subsidies which saw a quick end to the exportation of the republics food waste. 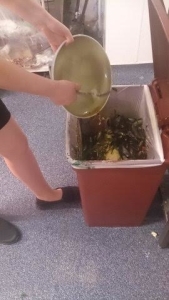 Northern Ireland introduces its own food waste regulations this July initially for large food waste generating facilities, but to affect all such facilities shortly after. This effectively closes another door to us seeking to export in this instance ‘Segregated Food’, not a waste but a National Resource. Pay To Use units have sprung up around the country in recent years, again encouraging the use of the mixed waste Black bag regardless of its contents. In 2015 I asked Philip Nugent Principal Officer at the DECLG Would PTU’s (Pay To Use) units be illegal on July 1st 2015? Yes no change to this regulation for PTU’s. Unless these units comply with Pay by Weight requirements by July 1st 2015 e.g. • Be able to weigh waste being deposited in them. • Be able to identify the depositor. or else they will be deemed to be operating outside of their license. Planning is being pushed through to ensure these units in future cannot be sited in areas where Council’s Local Waste Management Plan prioritises Kerbside Collection. Clean Ireland took a challenge in 2014 against a garage forecourt as PTU’s do not and probably never will conform to Pay x Weight’s requirements. However in rural areas having separate PTU’s that can identify a user, the waste being deposited into it and issue a receipt, could resolve the issue of non-economical runs by refuse trucks to scattered and far flung households. Poolbeg is wrongly perceived by many as being the panacea to all of the republics waste issues. I say wrongly as many don’t realise as I mentioned earlier and to which Indaver can attest to under EPA Licensing laws no waste facility in the republic can process any waste stream until the Bio Fraction has been removed from it. So even if Poolbeg was on stream tomorrow it could not process our national waste without the removal of the Bio Fraction. That would take a huge amount of facilities to remove that fraction and still we would be left with the resulting ‘Organic Fines’ that no one wants and for which we have very limited landfill space to even receive it. Poolbeg is necessary to keep our own waste resources in Ireland, and to create our own sustainable Circular Economy. Actually change people’s habits of those living in a Linear Economy, to those of wanting to live in a Circular one. Whatever form the new government takes it must divest itself from simply making statements to improve their image, while neglecting Ireland’s serious waste issues. Taoiseach Enda Kenny’s trips to New York and Paris in 2015 making wild speeches of us not being found wanting in stepping up to our environmental challenges, only to then run to the EU seeking special privileges again, did nothing to help resolve the environmental issues Ireland faces. As with roads Ireland needs a National Waste Authority whose road map will not be affected by political party’s personal agendas, or by council’s archaic planning regulations and city managers whims and often illogical conclusions. The Authority would finally give the private investors within the waste sector the security they need, with secured contracts to invest in Ireland’s waste industry, providing the much needed infrastructure and jobs that accompany such developments. Ireland’s soils would benefit from the then abundance of compost, and continue to feed grass that will in turn feed the IDA and Board Bia food export market. Media Concerns. Rte’s Philip Boucher hayes has compiled two really informative reports for the Mary Wilson Drive Time program in recent weeks. Please follow the next two links to hear his very telling views, and facts. 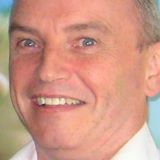 4-16 Drive time ‘Podcast’@ 1hr 40 min 35sec with Philip Boucher Hayes on Ireland never being able to attain its Carbon Emissions reduction by 2020 and at €5.47 a Tonne levy for any excess to a sectors permitted emission the EPA says the system just does not work. 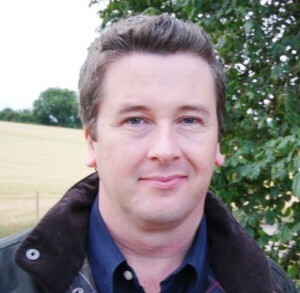 1hr 42 min 17 sec point of Drivetime programme Podcast with Philip Boucher Hayes on Alan Kelly signing up to the Paris environmental agreement in New York knowing full well that we can never achieve it, and that it will cost all of us dearly for this. Unless Food Waste is viewed by both Government and the citizens of Ireland as a ‘National Resource’ and not as a waste we will always be looking for a way to get rid of it. Viewed as a ‘National Resource’ then the opportunities it presents are endless, in providing jobs in the infrastructure needed to process the resource, in generating cost effective renewable energy and ending the Black bag on our streets crisis. Pay x Weight will assist every household in achieving low cost waste management, and by default will create an abundance of segregated Food Waste as an essential waste stream to support so many industries and jobs that can be created in those industries. Households owing to their limited access and inability to accommodate wheelie bins, must be given some form of waiver and not penalised for having to use a Black bag. However every avenue must be explored in seeking to offer these same households a way to segregate their food waste too, and enjoy the financial savings such an option would offer them. 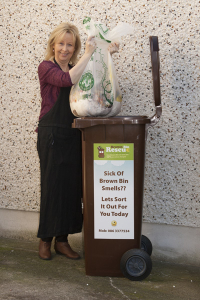 Brown Bin Rescues 15 kg commercial grade compostable food waste bags may well be the only option to achieve this. Thus providing even limited access households and businesses a choice of payment through segregation and further food waste recovery. Environmentally having local AD and Composting plants, significantly reduces the carbon footprint of not having to transport waste long distances for processing. Board Bia and IDA are constantly talking up Irish produce and well they may as coming from grass fed animals it rivals any other product on the market. That same grass depends on a soil that has to be as well managed as the businesses it’s supporting. Unlike chemical nitrates Compost aerates, conditions and binds the soil. Facilities such as Thornton’s in Kilmainhamwood in Meath work with local farmers who know the essential benefits to be had by using Compost. All of Ireland especially tillage farmers to whom Compost derived from ‘Food Waste’ has a unique nutrient value, all must be supported in using Compost if we are to have a soil that can support the aspirations of our growers and export. Accessing CIWM 2013 reports. CIWM 2 reports commissioned in 2013 on SRF and RDF exports from UK and Ireland. First report under heading to the right of its Home Page of Reports 2013 ‘ Commercial and Industrial Waste UK and Republic’ carried out by RICARDO – AEA . Section 4.6 and 4.7 relate to Ireland. Thank you for reading my view of the crisis that is looming in the Irish waste industry. A view I have formed from interviews with and comments from leading principals within the industry. Please feel free to contact me should you have any views on the above or if you wish to add to them.